Switzerland’s Federal Communications Commission (ComCom) awarded 5G radio frequencies to all three mobile operators – Swisscom, Sunrise and Salt – raising CHF380 million ($379 million). 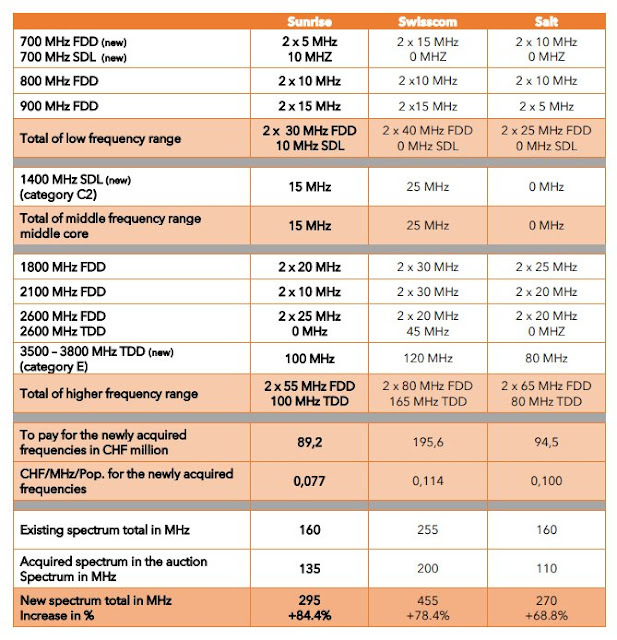 Dense Air, a small cell player which launched in 2018, pulled out of the Swiss auction. Reuters noted this “removes a potential rival for the three companies in the already crowded Swiss mobile market”. Swisscom, which paid CHF196 million, said by the end of 2019 it expects to roll-out 5G to 60 towns and communities. Sunrise and Salt did not have such concrete plans. The former said the frequencies gained will help it to “deliver a world-class 5G network in the future” and the latter that it will “improve its high-quality mobile network” with “next-generation speed, latency and capacity”. According to the chart on top (from Sunrise media release), you can see that all the three operators are well placed with a reasonable amount of coverage and capacity layer 5G spectrum. The 5G future looks good for Swiss. "I mean, in a perfect world, they would give you discounts or they would give you points or things that consumers would more tangibly want, rather than just the elimination of a pain point — which is what they're offering right now," Toronto-based consultant Charlie Wilton, whose firm has advised Bell and Rogers in the past, says. Teresa Scassa, who teaches law at the University of Ottawa and holds the Canada Research Chair in Information Law and Policy, says Bell has done a good job of explaining what it wants to do but there are also privacy and security concerns to consider. "What's new is that we're giving Bell customers the option to receive internet advertising that's relevant to them rather than the random online advertising they're receiving now. The number of ads customers see won't increase and they can opt out anytime by visiting bell.ca/relevant ads. We're giving customers advance notice before we start offering relevant advertising on Nov. 16." iPhoneInCanada has more details on this topic. The Relevant Ads Program was eventually phased out in 2015 after the Privacy Commissioner of Canada ruled the advertising violated Canadian law, as it automatically opted-in customers. Now, Bell’s current version of this ad tracking program recently asked customers last month to gain more access to personal information for improved “tailored marketing.” This data would arise from a Bell’s customers wireless or landline, internet, television, or anything related to Bell apps and the company’s affiliates. 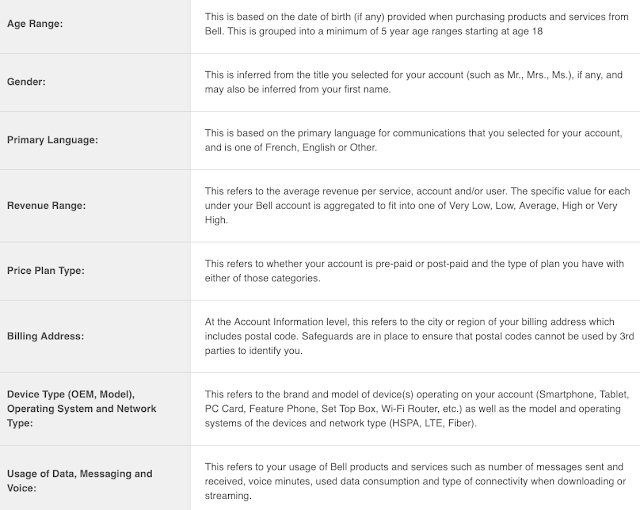 Bell says it wants to gain data such as a customer’s age, billing address, gender and specific devices used to access Bell services, on top of the “number of messages sent and received, voice minutes, user data consumption and type of connectivity when downloading or streaming,” for the sake of delivering more targeted ads. Both pictures above are from iPhoneInCanada. You can read more details about this story there. Its been an eventful five years for Pakistan’s mobile industry. The South Asian country has seen a dramatic increase in mobile broadband penetration and the introduction of 3G/4G services has impacted the lives of millions. In December 2017, 3G/4G subscribers in Pakistan numbered 47 Million. According to a recent report issued by Pakistan Telecommunication Authority (PTA), at the end of December 2018, there were 62 million 3G/4G Subscribers in Pakistan with penetration rate of 29.55%. That is a very significant increase indeed. However in a country so large and populous, their mobile broadband market is still considered to be at an early stage of development with penetration well below most other Asian countries. Strong growth is predicted over the next five years to 2023, driven by further adoption of 4G and eventually 5G services. The uptake of 3G/4G has been quite impressive that has given the government and the mobile operators the confidence to look forward to 5G. Presently four mobile operators provide services to the country. Here are there most recent market shares/figures. Jazz (created by the merger of Mobilink and Warid) is the current market leader with the largest number of subscribers. In 2016/7 they merged with Warid and adopted Warid's 4G network and offer their 4G/LTE to all of their customers as a single brand. In 2017 they received an own license for 4G on 1800 MHz (band 3). Their tagline is “Dunya ko Bataa Do” (tell the world) and their partnering with travel vlogger Eva Zu Beck to showcase their coverage and the culture of Pakistan has been a popular advertising strategy. Norwegian owned Telenor is the third largest operator in the country. 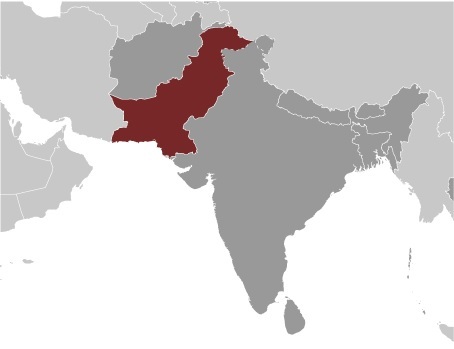 They cover more than 80% of Pakistan's population in urban and rural areas with a network of over 11,000 cell sites of which 80% are 3G and 70% are 4G enabled. 4G/LTE was started in August 2016 in Islamabad, Karachi, Lahore, Multan, Peshawar and Sawaton on 850 MHz (band 5) and has spread to other major towns. Telenor was the first network to enable VoLTE and officially launch 4.5G (LTE Advanced) in Pakistan. It has done so by aggregating two LTE bands, FDD-LTE Band 5 (850 MHz) and FDD-LTE Band 3 (1800 MHz), a portion of which has been re-farmed for LTE, it was previously used on the 2G (GPRS/EDGE) network. Telenor's new LTE-A network will initially be available in Karachi, Lahore, Rawalpindi and Islamabad. 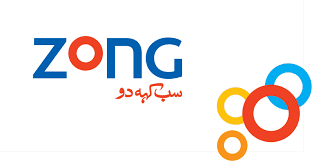 Zong in Pakistan is owned by China Mobile Pakistan. It has a limited network on 3G in many towns but was the first to launch 4G/LTE on 1800 MHz (band 3) in the centers of 7 major cites in 2014. It presently has over 9 million 4G subscribers, more than any other network. According to Zong when it comes to 4G coverage, subscribers, internet speed and innovation, no other network can reach the heights of Pakistan’s No.1 data network. They more than 10,000 4G towers with plans in place to launch 5,000 more 4G sites in the next 3 years. 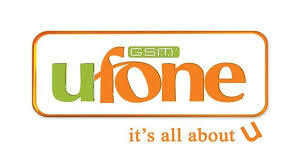 Ufone owned by Etisalat is the fourth operator in the country. It has 3G network coverage in over 9,000 locations and across all major highways of Pakistan. There is no 4G/LTE yet. A recent Pakistan Telecommunication Authority (PTA) survey found Ufone takes 5.73 seconds to connect a call, the fastest among all networks in the country. 2018 was a great year for Pakistan’s Technology industry with substantial growth and development in IT Sector and for 3G/4G penetration. Supported by growing tech-savvy population, increasing businesses and rising internet penetration, Pakistan is destined to become one of the fastest growing economy by 2030 and has the potential to be one of the leading digital economies. There is a lot of promise in the IT sector of Pakistan with young population turning to computers and other digital technologies creating a huge market for local and foreign investors. According to ITU Measuring the Information Society Report 2017, Israel has a vibrant and competitive mobile market. The privatization of incumbent operator Bezeq (now operating under the brand name Pelephone) started in 1991, followed by the opening of the mobile market to a second operator (Cellcom) in 1994. At the end of 2016, five mobile network operators and a number of MVNOs competed in the mobile market. These include MNOs Partner Communications, Hot Mobile, and Golan Telecom. The latter two entered the market in 2012 and are both owned by transnational French telecommunication groups. With their low-priced offers, they have been able to gain significant market shares and intensified competition between the operators. Mobile-broadband penetration is increasing, and above the European average. 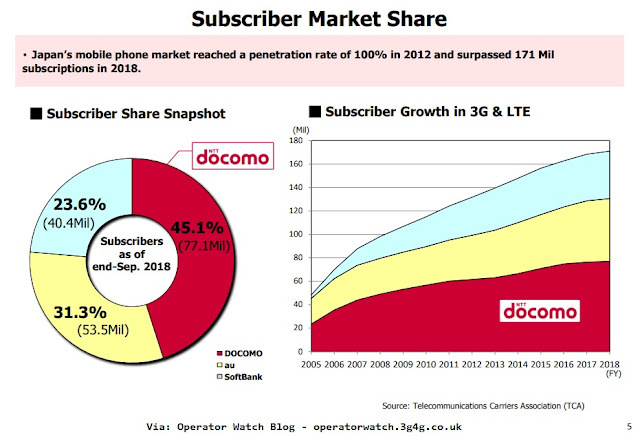 Operators continue to invest in 3G and LTE networks and 3G population coverage is almost complete. A new mobile operator we4G was launched on April 10, 2018. According to Telegeography, Israel has a new mobile network operator in the form of 018 Xfone, which has launched services under the ‘We4G’ brand. The network went live today (10 April), and reportedly leverages network sharing agreements with incumbent cellcos Cellcom and Golan Telecom. According to a previous report by local news site Globes, the newcomer will be using the ‘051’ prefix previously assigned to Pelephone. According to TeleGeography’s GlobalComms Database, 018 Xfone is a subsidiary of Marathon Telecom, which is itself controlled by Israeli businessman Hezi Bezalel. In January 2015 the telco agreed to pay a total of ILS33 million for a 5MHz block of spectrum in the 1800MHz band, and went on to receive the frequencies in August that year. Israel’s telecoms regulator unveiled plans on Thursday to publish a tender for fifth generation (5G) mobile networks in the first half of 2019, at a time when fierce competition has slashed profitability at local operators. The Communications Ministry expects the tender in April or May, with the hope frequencies can be allocated by the end of 2019 and 5G can be launched between 2020 and 2023, the ministry’s director-general, Netanel Cohen, said. He estimated a 5G network - which would be an additional layer on existing 4G networks - would cost around 2 billion shekels ($529 million). The cost, though, may be too steep for operators, which are struggling to remain profitable in a country with 8.9 million people and nine mobile providers. He said only the six main mobile operators would be eligible to bid for 5G licences, leaving out the three virtual operators. Since there are only three networks in Israel - owned by Cellcom , Partner Communications and Bezeq unit Pelephone - companies will be encouraged to join forces and bid together. Raz-Dror said operators would not be required to deploy 5G in all of the country but would have to move away from 3G and improve 4G networks.